How to calculate Monthly Average Balance (MAB) for your SBI or other bank account? Are you confused regarding MAB? 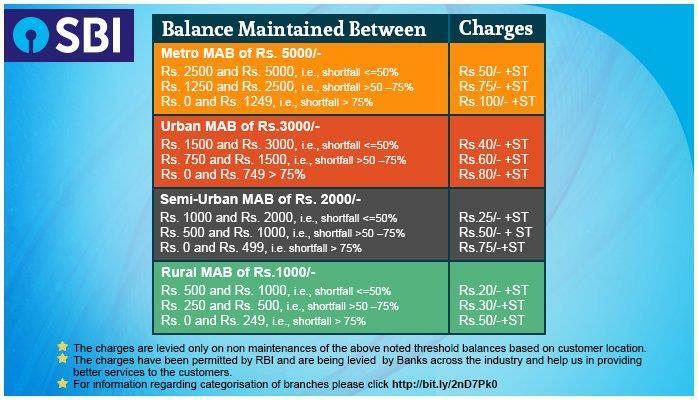 State Bank of India has introduced the rule of maintaining minimum balance of Rs. 5000 in your savings account. Here is step by step simple procedure to calculate the monthly average balance in your bank account. Most of the banks ask for minimum balance in your savings accounts, be it ICICI bank, HDFC bank, Kotak Mahindra Bank, Axis Bank, Karnataka Bank or State Bank of India. But after SBI has increased its limit of MAB to minimum Rs. 5000; most of the people of confused. Everyone is not born perfect. So we understand that you might also be a mathematician expert. Hence we are here to solve your problem. But before proceeding further, let's have a brief study on the latest rules of SBI Monthly Average Balance. What is the penalty for not maintaining minimum balance in SBI ? Every savings account holder is now required to maintain min. bal. in his/her bank account. Here is the list of penalty or charges for non-maintenance of MAB. When a person asked this question to SBI officials on their Twitter account, their reply was " Service charges for non-maintenance of minimum balance were waived earlier, enabling the customer to maintain zero balance in the account. However, wef 01.04.2017, MAB are stipulated based on the center in which the account is maintained and the service charges levied are graded as per the shortfall of the MAB. Please refer to our complete schedule of service charges at https://t.co/Lu16fgLhX1"
Firstly, you should know that banks consider Minimum Average Balance and not minimum balance. This means that your bank authorities will calculate the average amount of balance maintained in your savings account. Thus they consider the closing balance in your account on each day -of the month. Let's start with an example for a month of 30 days. Thus, your MAB is Rs. 6700. Hope I have made the concept clear in an easy manner. If anything is still unclear or if you have any doubt, please post it as a comment below. I shall be glad to help u.